Luang Phu Kambu has released a special edition of Classic Pra Pid Ta amulets in various Sacred and Precious Metals. 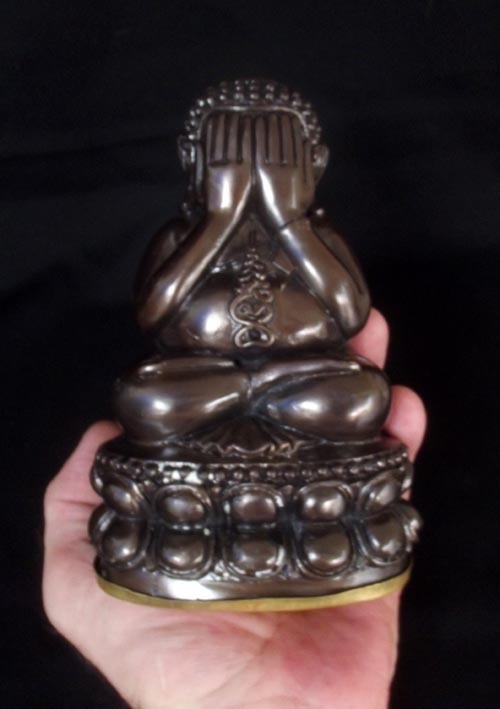 As the Flagship Model, this Bucha size Pid Ta is a First Class Piece of Fine Buddhist Sacred Art that will grace the Altar with its Majesty, and bestow Blessing upon those who Pray, and those within Your Household or Private Temple. The Pid Ta have a Kring Bead inserted inside them (Sacred Rattle), and are thus not only Pid Ta, but also ‘Pra Kring’ amulets. This example is made from ‘Nuea Nava Loha’ (Nine Sacred Metals smelted from Ancient Artifacts and Amulets). 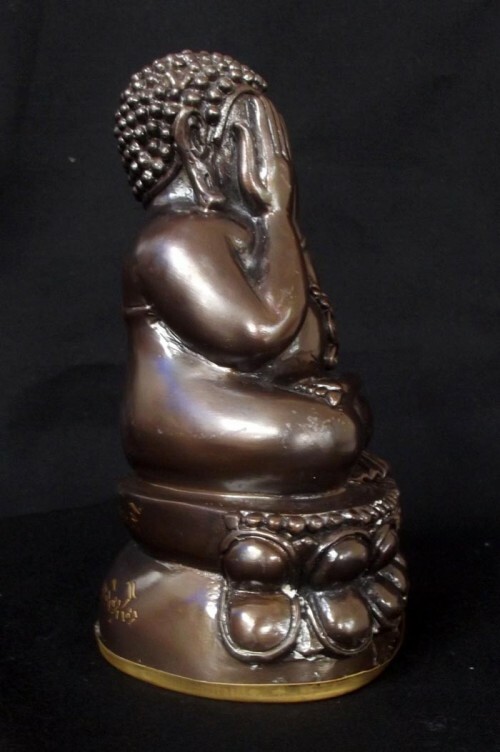 Bucha size Pra Pid Ta 3 Inches wide, 5.8 Inches high – 199 statues made with ‘Phiw Rom Dam Man Pu’ (black oily finish). 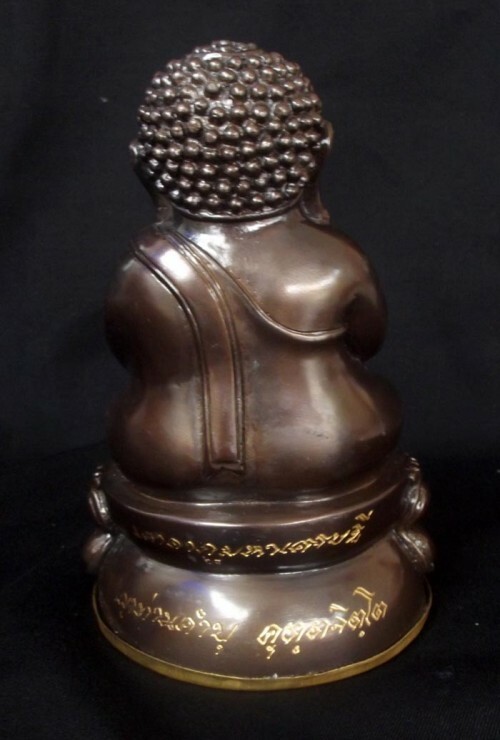 The base of the statue has hair of Luang Phu Kambu, Puttakun Powder, and ancient ‘Mai Sim’ wood inside the statue. The base of the Statue has some hair of Luang Phu Kambu, Puttakun Powder, and ancient ‘Mai Sim’ wood inside the statue. 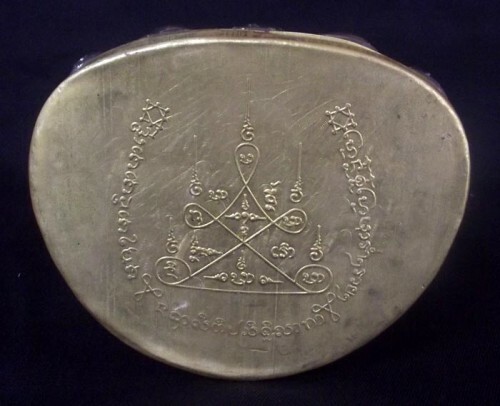 The base is sealed with a Sacred Brass Alloy plating, with Sacred Yantra inscription. Only the Bucha statues have a Sacred Brass base covering. All the smaller Loi Ongk amulets of the series were issued with a solid silver base, except for the Gammagarn set which has solid gold base covering. 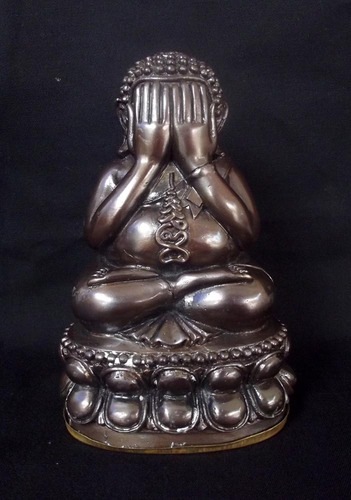 The Large Hands of the Buddha represent ‘Maha Lap’ and ‘Maha Pokasap’ (Wealth and Treasures), for the Large hands are able to collect large gifts and sums of money. This is thus not only Pra Pid Ta Maha Lap, but also Maha Pokasap and ‘Rap Sap’ (get treasures and windfalls). Pra Pid Ta also is a Powerful Kong Grapan, Klaew Klaad and Anti Black Magic Protection.